Keep your favourite memories close with a small photo book from bonusprint. There are loads of great ways to customise your landscape photo books with our creator tool. And it couldn’t be easier to order your personalised book online. Whether you’ve snapped sweeping cityscapes or cosy group shots from a weekend away, share your pics in a landscape photo book. 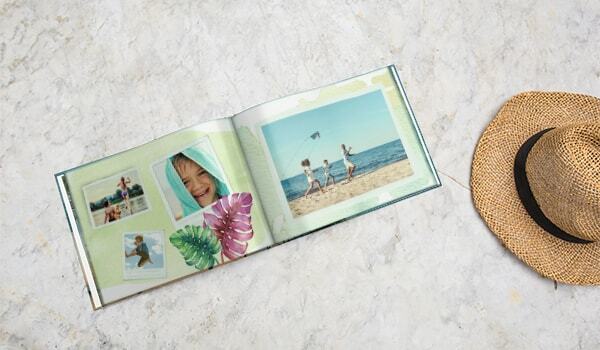 You can print impressive panoramas across a large layflat book or take your favourite family moments with you in a small landscape photo album. For a fun scrapbook-style book, why not go for a spiral binding? And for a lightweight album to flip through with friends, you can customise a medium-sized soft cover book. Whichever size you choose, it’s easy to personalise any photo book in landscape. Just check out our creator tool to get started. You can get creative by designing your photo book from scratch. First, head to our creator tool to filter by portrait, square or landscape photo books. When you’ve selected landscape, you can filter by size. Now here comes the fun bit. Upload the pictures you love then play around with clip art, background designs, masks and more to make a book that’s personal to you. But if you need a hand getting started, you can try out our Smart Assistant to arrange your best snaps for you. There are pre-designed photo album layouts in landscape too to give you inspiration. Ready to order your landscape photo album? When you’ve set out your photos, click ‘add to basket’. From here, you can add all the finishing touches to your landscape photo book. Why not select gloss paper to bring out all the vibrant colours in your travel shots? And if you’ve picked a linen cover, you can personalise your album with a title. Then you’re ready to confirm your order, and you’ll be able to add your new landscape photo album to your bookcase or bag in no time.